The biggest difference between the Common Core Standards and the California Content Standards lies in instructional approach. While the Content Standards are focused on students acquiring and remembering content knowledge, the Common Core Standards are focused on students developing particular skills. Therefore, while the materials used in our classrooms might be the same, the ways we invite students to access them might be radically different. For example, in the past, we might have been hell-bent on students knowing, as soon as possible, factoids such as that the Abbasids murdered the Omayyads during dinner. We might lecture, maybe show a PowerPoint, entertain a host of questions, hand out a worksheet, walk students through that worksheet, and, as students get started completing the worksheet, entertain any and all questions (usually low-order) that the students have along the way so that students may complete the worksheet perfectly without making mistakes. We might then, perhaps, grade that worksheet. > Post a question on the board such as "What are some examples of competitions for territory that were won or lost through strategic murder off the battlefield?" > Provide opportunities for students to discover, on their own, the answers to that question, and other questions that emerge along the way, en route toward an ultimate goal, which might be to reenact one of those competitions for territory. > Supply students with tools to use on their journey such as textbooks, computers, and maybe even realia, and ways to keep track of the information they unearth, such as double- or triple-entry journals, graphic organizers, concept maps, or even a menu of possibilities that students choose from themselves, including methods they divine themselves. Tell students the ultimate goal, which is to reenact one of those competitions for territory, and then let them arrive there, providing nudging (not micromanaging) guidance along the way. Rather than teachers being disseminators of information that students memorize and regurgitate, teachers should be event planners orchestrating occasions for discovery, or professors on archaeological digs alongside graduate students who also dig. Teachers should let go of the need for students to remember facts and instead insist that students know how to find, use and share facts. Even more precisely, students are to answer old and generate new questions. While there is much talk of the benefits of having students work in small, cooperative groups, not all small, cooperative groups are created equally. Some actually undermine student achievement. In order for a group to be effective, it should be: 1) mindfully composed; 2) set on a clear path toward a specific goal; 3) involve students who each know their roles; and 4) result in students being held individually accountable. One student is the leader, and five other students are group members. The teacher assigns the role of student leader and reassigns/rotates that role as desired to meet certain students' needs. 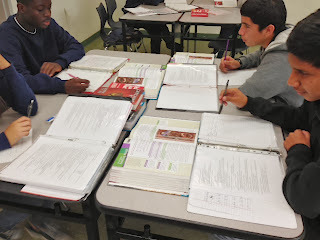 The student leader and his or her group members agree on a text from a menu of possibilities (specific short stories, plays, novellas and/or novels). Then the leader chooses from a menu of read-aloud possibilities (round-robin, choral, popcorn, or silent), and, as the group members read the text, the leader stops to ask the members questions contained in "How to Read a Narrative." Upon completion of the text, each group member writes her own literary analysis essay and/or creates another proving product. One student is the "teacher" and five other students are his or her "students." The teacher assigns the role of "teacher" and reassigns/rotates that role as desired to meet certain students' needs. The student assigned as "teacher" chooses from a menu of grammar lessons and walks his/her “students” through the completion of one or more of those lessons. This is more fun with a consumable workbook, but texts and paper may suffice. 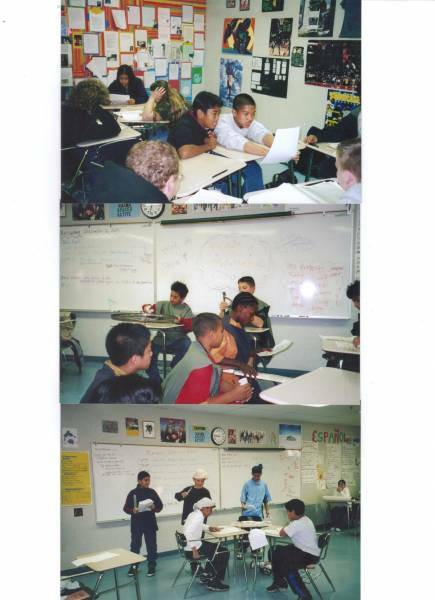 On a side note: Having students read and interpret directions to each and every lesson in the aforementioned or similar way ensures that: 1) students will be adept at reading and interpreting expository text; 2) students will become adept at problem-solving; 3) students will become expert at explaining their thinking to others. In a teacher-directed (not cooperative group) lesson, I follow the unassisted minutes with, “You have two minutes to discuss with your neighbors your process. Now is the time to share your thinking and/or ask others for assistance. Please ask others before you ask me, so that those others can practice teaching.” Then, after two or so minutes of helping one another, I countdown to silence, which resumes for another five or ten (or more) minutes. I alternate silence and talking so that students may alternate deep thought with explaining their thinking. I avoid a constant din of talking because it limits the capacity for most students to engage in deep and sustained thought. One student "hires" others to help with his/her unique project. That one student earns the grade. The others earn both a sense of accomplishment and additional practice. Indeed, there are other group configurations, and we should choose (or create) those configurations to fit our students, as long as we don't underestimate their abilities to handle such work. While many of us will likely provide to our students entire “units” on expository text, one simple way to ensure that students know well how to read and use expository text, is every day when we hand out directions to something. When we dole out directions, we should let the students read and interpret those directions without getting immediate overt assistance from us. Every time we provide a handout or page in a textbook that explains what to do, we should avoid telling the students what that text says, or worse, telling them what to do. Let students read and interpret that text alone first. Let them get started doing what they think the text says to do. Let them infuse meaning into those very important words. If students are reading for meaning in a moderately high-stakes environment every period of every day, they will become experts at expository text. If they are told what those texts say – if the teacher is the only one doing the thinking – then the students will not become experts at expository text. Or at problem-solving. Or at bravery. If students are confused for a while, so be it. Nothing deleterious will happen if they are confused for five or seven or even more minutes. That confusion will lead to problem-solving which will is lead to Eureka moments. If you project onto students worry or fear or “Oh, no! He doesn’t understand this immediately, I must save him!” then students will internalize that fear. They won’t die if they are left to read and interpret a piece of paper for a few minutes on their own. This is true for students with IEPs as well – in fact, it is even more true for students with IEPs. Wait time is a help, not a hindrance. Shift the goal of the lesson from immediate understanding and perfect answers to the development of problem-solving skills. One way to make this easier for everyone is to grade the students for their efforts as much as for their products. Rewarding process toward eventual mastery more than immediate perfection during performance makes the risk-taking easier to handle. While it may seem counter-intuitive at first, the results will be far greater; and the more teachers there are who do this, the more students will embrace it and the less they will fear it. They will come to know that this paradigm of inquiry-based problem-solving is the new Common norm.